TimeTrak is not just a flexible knowledge management solution, it has added functionality including job tracking, scheduling, inventory management, project management and workplace safety and compliance, making it the perfect full feature solution for any sized contractor across any trade. TimeTrak provides one platform where all information is stored. 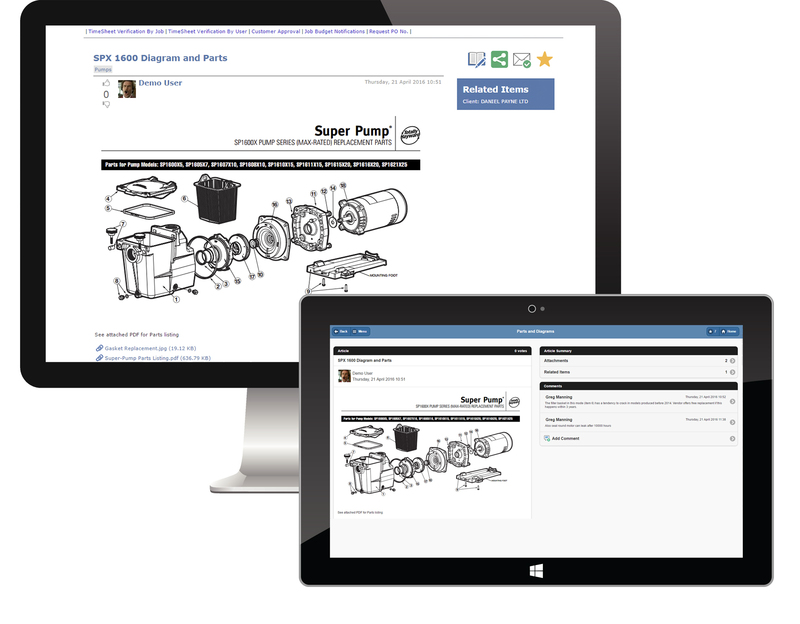 Our Knowledge Base feature allows the storage of any kind of information, from critical site information, client documentation, drawings or parts information, plus it also has the functionality to attach files, photos or checklists to each article or question, and allows TimeTrak users to add comments or questions to each. You have the flexibility to upload, search, view and email articles, questions, documents or photos from either the office or the field. Keep critical information with you, wherever you are. Accessible from both the office and the field, your team can keep critical information with them at all times. No longer will your technicians need to return to the office, wasting precious billable time, to retrieve documentation - it is all available on their mobile device. Take Hazard registers, parts schemas, etc. with you on the job without the paperwork. TimeTrak Knowledge Base allows your field team to gain access to any information they require while on a client site, as easy as if they were sitting right in the office. Store your documents in the cloud and access them anywhere with an Internet connection. TimeTrak offers a powerful document storage solution that allows your team to upload and access files any where, no matter their location. With the ability to create a variety of knowledge bases for different areas of your business or teams, TimeTrak allows for different visibility levels for your users. Store files directly to a job, client or asset, providing your team with an easy to use document storage and retrieval system that they can use wherever they are. Centralising your Organisations Knowledge – why, how and what are the benefits?